One in eight women will be affected by breast cancer (BC) in their lifetime. Although studies have attempted to understand the interactions between BC and the tumor microenvironment, no models have been able to replicate them in a way that is both physiologically and anatomically correct. These interactions are particularly important as studies have shown that not only cancer cells behave different when cultured in 3D vs 2D models, but also that the ECM and cellular components of the microenvironment play a role in tumor behaviors that include proliferation and response to treatment. We have engineered a 3D biomimetic platform that allows for the study of tumor interactions with its microenvironment, in an ex-vivo model that includes physiologically relevant components, as well as anatomical relationships through the use of breast glandular organoids, adipocytes, a stromal vascular fraction (SVF), and BC cell arrangement in a way that resembles highly cellular, monoclonal masses characteristic of tumorigenesis and metastatic proliferation of cancer foci. HS578T cells tagged with Red PKH26 membrane stain were mixed with 0.6%w/v collagen with a density of 2,000, and 40,000 cells/uL; 1uL of the collagen/cancer cell mix was plated on the center of a glass-bottom 96 well plate and allowed to gel, forming a hemi-spheroid. 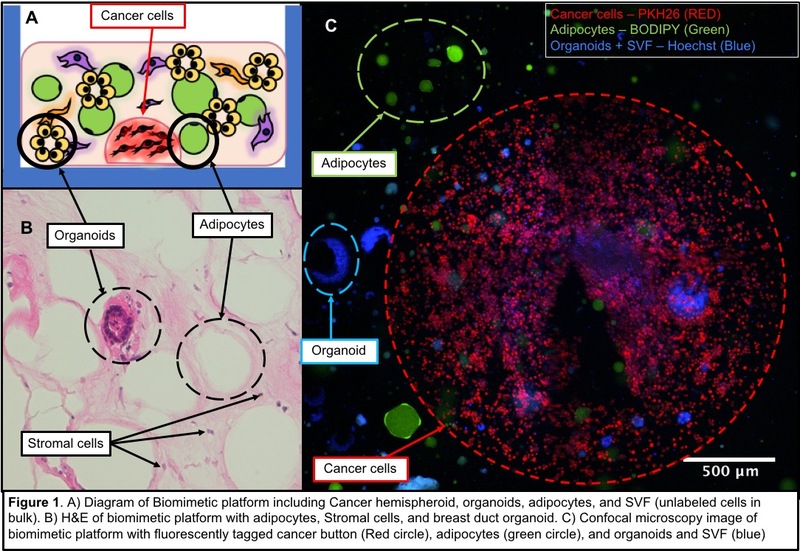 Adipocytes, SVF, and breast duct organoids were isolated from surgically resected breast tissue. Isolated components were mixed with 0.6% w/v collagen to form a homogenous biomimetic platform and resulting collagen biomatrix was plated on 96 well plate over the cancer hemispheroids previously plated. Constructs were cultured and analyzed at 0, 7 and 14 days. Confocal microscopy revealed successful fabrication of cancer “buttons” within the engineered biomimetic platform as well as the collagen hydrogel without cells. Cultures of cancer cells were kept in culture for 14 days, and hemispheroids with a high density of BC cells (40,000 cells/uL) demonstrated invasion and penetration into surrounding biomimetic platform after 7 days of culture. We have successfully created a biomimetic model for the study of tumor behavior with the use of highly dense BC cell buttons cultured within engineered breast tissue (Figure 1). Branching of the hemispheroid suggests that our platform, with anatomical configurations that resemble not only the breast architecture but the structure and clonality of tumors, can be utilized for the study of patient specific tumor progression, and potentially, treatment response.